In the 1990s, the McLaren F1 reset the benchmark for road car performance. It stormed to 60 mph from a standing start in just 3.2 seconds, to 120 mph in 9.2 seconds. On Volkswagen’s epic Ehra-Lessien test track, it reached a top speed of 243 mph. For a sports car that accelerated to 150 mph in the same time it took a Porsche 911 to hit 100 mph; that in sixth gear zoomed from 180 mph to 200 mph in less time than a Ferrari 512TR needed to go from 50 mph to 70 mph in fifth, the term supercar no longer seemed adequate. The McLaren F1 was the first hypercar. 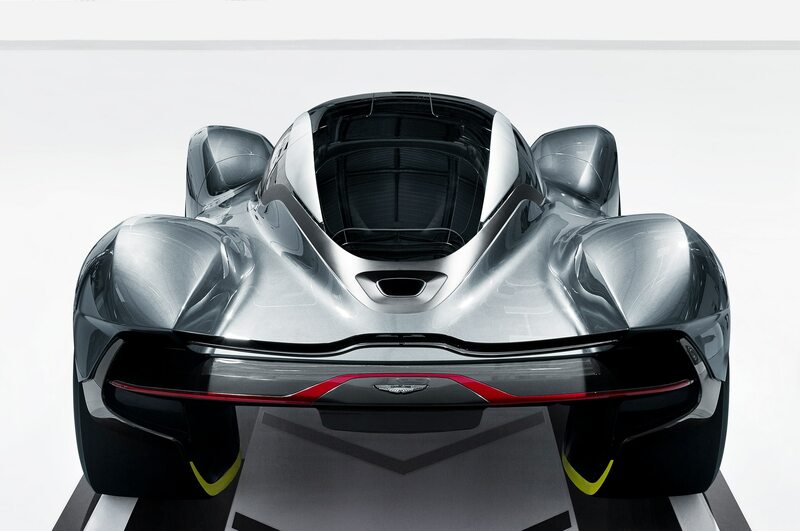 Now, some 20 years later, another storied British brand steeped in performance, Aston Martin, is planning to build what it says will be “the hypercar of our time.” Meet the Aston Martin AM-RB 001. The prosaic moniker belies an extraordinary concept with an astounding performance target: a road car that will deliver race-car levels of acceleration, cornering and braking. “We’re talking an F1 car in race trim, not qualifying trim,” hastens Aston Martin marketing communications chief Simon Sproule. OK, consider our expectations managed. The McLaren F1 was the brainchild of rock-star Formula 1 designer, Gordon Murray, who worked for the Brabham and McLaren teams. 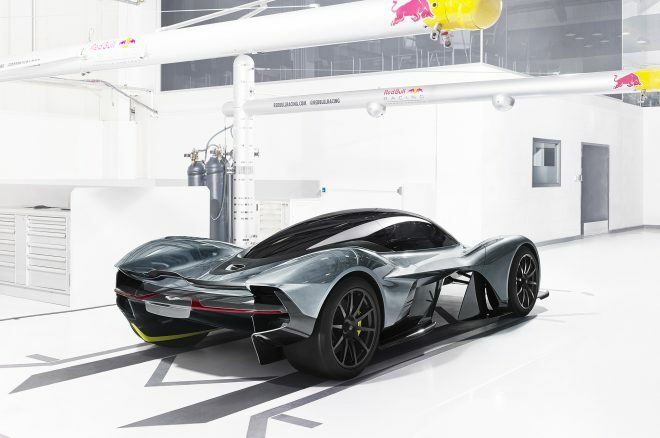 The driving force behind the AM-RB 001 is another rock-star Formula 1 designer, Adrian Newey, creator of Formula 1 championship-winning cars for Williams, McLaren, and, most recently, Red Bull Racing. That explains the RB part of the new car’s name. But why the AM, Aston Martin? Synchronicity. Aston Martin boss Andy Palmer had been mulling a hypercar project to boost the brand’s profile (and keep investors happy) in the lull between the end of DB9 production and the rollout of the new DB11. Palmer and Sproule, who both formerly worked at Nissan, had come to know the Red Bull Racing operation after Infiniti became a team sponsor in 2011. 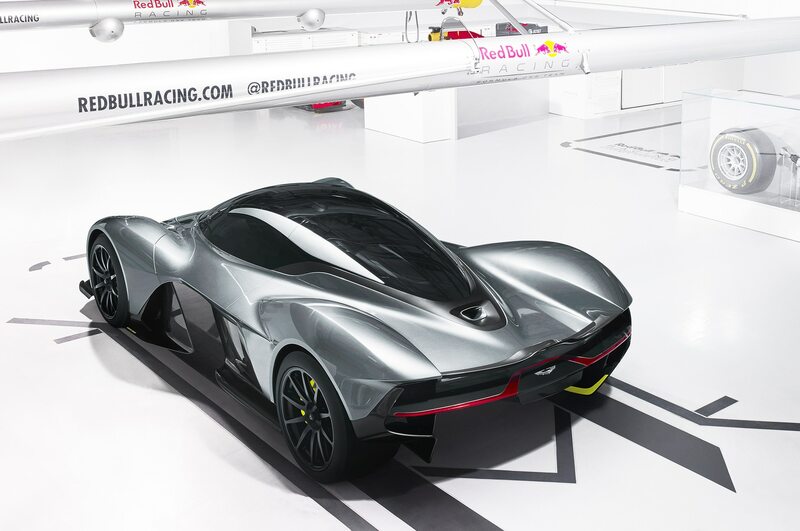 They were intrigued to discover Newey, who in 2014 stepped down from front-line work with the Red Bull F1 team to head Red Bull Advanced Technologies, was also thinking about designing an extreme sports car. The McLaren F1 was famously conceived in an airport lounge while Murray and McLaren race team executives Ron Dennis, Mansour Ojjeh, and Creighton Brown awaited a delayed flight after the Italian Grand Prix in 1988. 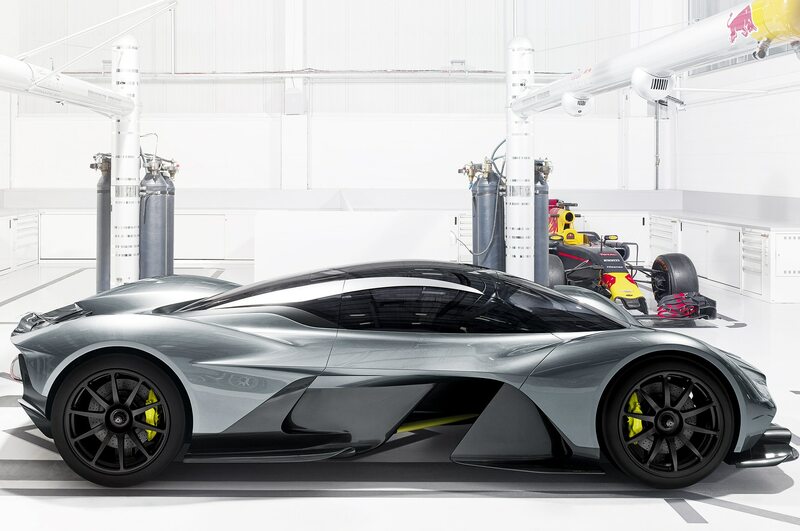 History will record the AM-RB 001 was born in January 2016 over a sausage-and-mash lunch in a pub near Woburn Abbey, just north of London, attended by Palmer, Sproule, Newey, Red Bull Racing team principal Christian Horner, and Aston Martin design chief Marek Reichman. The concept model is about 95 percent the final design. 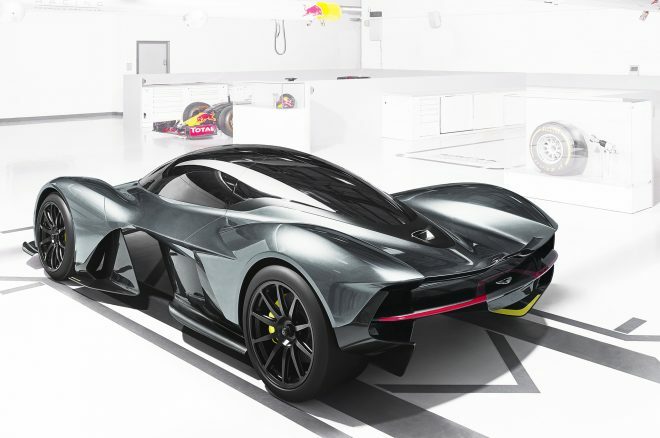 “Both Marek and Adrian had been sketching cars independently,” says Sproule, “and when you put both together they looked remarkably similar.” At least they did on the surface: The AM-RB 001’s secret sauce, the key to achieving its eye-popping performance target, is the Newey-designed aerodynamic package hidden underneath. 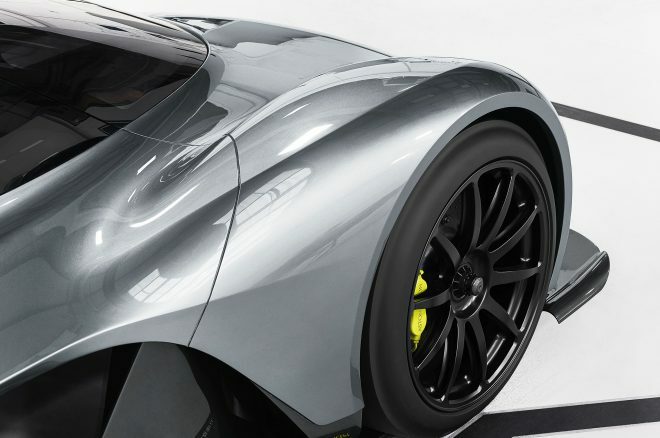 The AM-RB 001 is basically a ground-effects car, its radically sculpted floor higher off the road than the body sides. What at first glance looks to be a grille up front is merely a giant opening to funnel onrushing air into tunnels along either side of the cockpit. 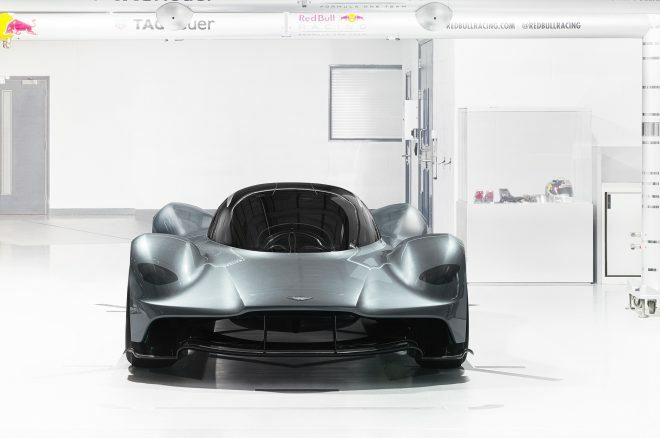 The first running prototype is a year away; the first production car is due in late 2018. In the meantime, Newey is honing the AM-RB 001’s final design on the Red Bull race-car development simulator, benchmarking it against a rich vein of incredibly detailed and carefully calibrated performance data from the Formula 1 team. Just 99 road cars are planned, along with up to 20 more extreme race versions. If you have to ask, you can’t afford it, but for the record the ultimate Aston Martin is expected to sell for about $3.2 million. Hybrid RWD powertrain: The internal combustion engine will be a new, bespoke, naturally aspirated V-12 of between 6.0 and 7.0 liters, supplemented by an electric motor charged by a KERS system. Total system output should be more than 1,000 hp. 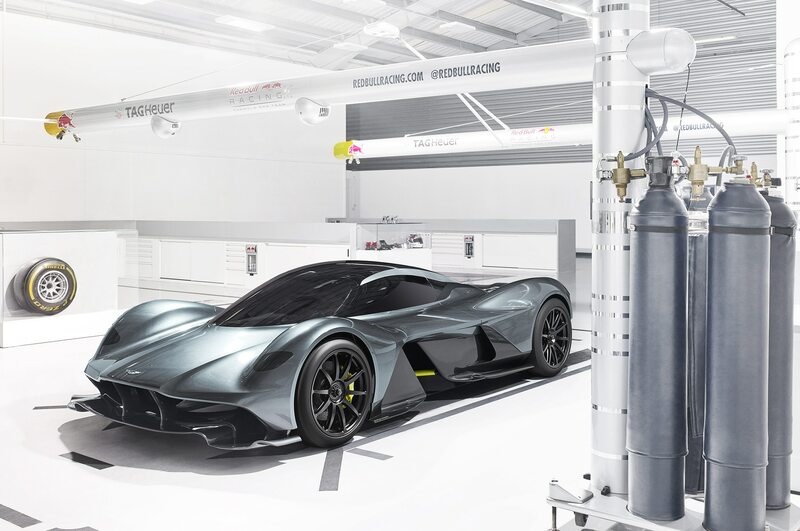 Lightweight construction: The entire car will be constructed from ultra-lightweight materials, including carbon fiber and titanium. The target power-to-weight ratio is 1 horsepower per kilogram (2.2 pounds), about the same as a Hennessey Venom GT or Koenigsegg One:1, which means a total weight of 2,200 pounds. Transmission: The rear wheels will be driven via a semi-automatic eight-speed sequential shift transmission. Ground effects: What at first glance appears to be a conventional grille is actually a massive vent that ducts air over a radically shaped floor. The front of the floor is as high as the opening’s top lip and then swells outward like a boat hull as it drops down around the cabin before tapering tightly toward the rear of the car. Huge venturis on either side will promote downforce. 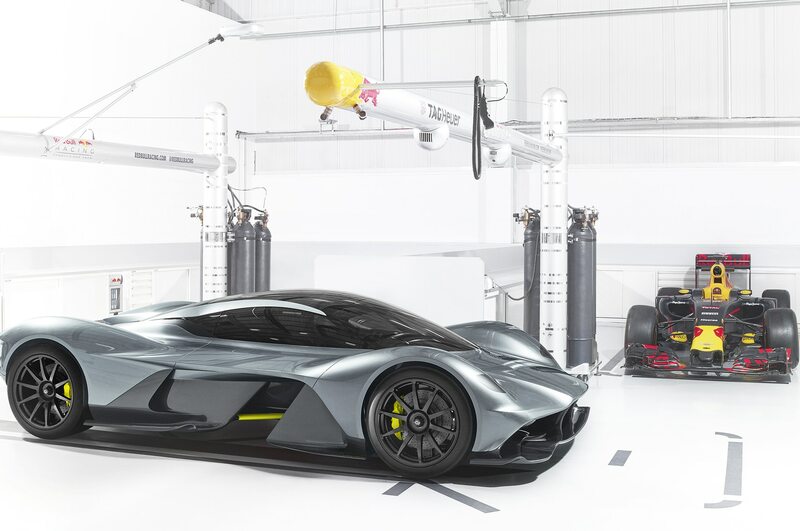 Variable ride height: The final suspension specification has yet to be decided but will feature F1-style streamlined suspension links front and rear, plus an adjustable ride-height function to allow the car to be driven on normal roads and deliver ultimate grip on the track. Blown rear spoiler: The final placement and number of exhaust outlets are still to be determined, but burned gases will exit through the top surface of the car and will be used to blow the rear spoiler, increasing downforce. Two-seater: The snug cockpit will have room for two, with side-by-side seating. A seating buck has been built around the current dimensions, but cabin width might be increased slightly for production. The aerodynamic floor means the occupants will be reclined, with their feet raised higher than usual. Performance: The AM-RB 001 will not be as fast in a straight line as the forthcoming Bugatti Chiron, which is expected to top 275 mph. The focus will be on track lap times, so expect a 0-60 mph in about 2.5 seconds, plus sustained lateral grip and braking in excess of 2 g.